The time Vepar’s group arrived at the gate was when Hifumi’s figure had already vanished into the castle. Hifumi’s spirit was simply uplifted by the battling. He knows that the time for that game was short. The healing magician girl who followed Vepar, vomited with all her strength abruptly once she saw the terrible scene and one of the girls, who was right next to her, joined in. Vepar, who shrugged her shoulders while saying “Good grief”, calmly surveys the gate’s vicinity. Not a single living person is around. Without regards to whether man or woman and their age, all of them were equally visited by death. Vepar answered the question of her subordinate, who had a pale face although she hasn’t thrown up, with a sigh mixed in. Folding her arms, Vepar twists her mouth in the shape of へ. “If there’s a problem”, Vepar raised her eyes at the castle and even her subordinates, except the two who were still vomiting, likewise looked up at the area around the king’s private chamber. Everyone nodded at Vepar’s words. The demon soldiers know why he continues to reign as king although he looks like nothing more but a young boy. The mood, which should be gloomy, didn’t become too tense thanks to the girls. While Fokalore’s army is showered with cheers by a crowd of people, they form lines by the city’s large front gate and leave. The expressions of the soldiers, who are donning battle gear on their bodies and held weapons such as swords, spears and some of them even kusarigama‘s, were smiling faces tinged with nervousness. They number 500. But even then it’s no more than less half of the soldiers serving as regulars in the Tohno feudal army. Only this earldom possesses the financial leeway to uphold such a large-scaled standing army, which is a money sink, with the exception of each nation’s capital. Even bold scolding was mixed into the high-pitched encouragements. It was completely like being overwhelmed by waves of sounds. The soldiers, who left the city, formed lines with accustomed movements, matched their faces alongside the highway and looked at the person in the front. Advancing at the lead, from atop an open-air carriage with no canopy, Alyssa stretches her small body as best she can while shouting and received a reply with many voices overlapping. Beside Alyssa Miyukare is riding with her on the carriage, which began to advance slowly, as her advisor. The soldiers start to move and in their backs the carriages of the supply unit, carrying goods, follow. Miyukare smiled while holding out a cup filled with tea to her. Seeing the face of Alyssa, who returned a smile, Miyukare frantically suppressed the thump within her nose and grabbed the documents placed nearby. While pouting, Alyssa adjusted the position of the short sword which is hanging at the back of her hips. With the carriage’s vibrations making a stir, it’s difficult to sit. Miyukare, who barely manages to keep up a poker face, faints within her mind. Alyssa showed her a bright smile, but once she turned her sight towards the walking lines of soldiers, her look became serious. As people are gathering in Fokalore, a great number of people is necessary for security and maintenance of public order. Given that there are that many people who have turned up looking for work, there was no particular problem in regards to replenishment of personnel. The elites, who repeatedly practised and studied, have been assigned to their respective fields of expertise. Although it happened that sometimes some lost their lives due to incidents in the city and the battles with monsters, there was no substantial influence due to that and the Fokalore feudal army became huge. And, after several battles, it’s a military operation after a long time. On the platform wagons, which are being used as usual, Prulfras has installed a new type of spear throwers he himself named to be of satisfactory quality. Alyssa’s look faced towards Miyukare. The laughing Alyssa unfastened the scabbard with the short sword from behind her hips and drew it out in front of her eyes. Turning over her wrists, light is reflected in a momentary flash. It was at the time Hifumi was maintaining the katana after meditating and finishing his daily practise. Alyssa planned to have her meal together with the three of them, Origa included, but at the moment she entered Hifumi’s room, there was a man and his katana standing in the room shrouded in a silence that was painful. Unintentionally raising the tone of her voice, Miyukare blushed. Alyssa, who giggled for a while, wiped her tears with a finger. The carriage sways grandly as it runs over a pebble. In contrast to Miyukare whose balance crumbled a bit, Alyssa lightly half-rose to her feet and cushioned the impact. She gently strokes the scabbard of the short sword. The scabbard which had been polished to the degree of blackening just like Hifumi’s, had a blackness making somebody believe that its darkness erased the lustre purposely. Miyukare noticed that the questionable light visible within Alyssa’s resembled that of Hifumi. For the soldiers following in the back it didn’t appear as anything but two women calmly chatting, but only the veterans reliably felt the somehow frightening mood they already experienced before. Hifumi had cuts and burns all over his body. Both his arms and legs were plastered with bruises as well. And yet, he daringly walked forwards holding the katana with his right hand while the point of the katana and his fore-bangs were dripping with blood. If Origa or Vepar saw that, they might have judged it as lovely appearance. With his hakama having holes all over, his skin is showing at his sides and the right shoulder. Hifumi, who openly entered the castle through the door as if luring them, proceeds onwards while feeling the looks of several people. Although the owners of those looks aren’t attacking, they are filled with plenty of hostility. They are probably comrades of the lot I killed outside. It was Phegor who made an appearance in the dark hallway ahead. The smile he showed during daytime has vanished. His look is piercing in order to not oversee even one of Hifumi’s moves. Hifumi planned to thank for that honestly, but Phegor took it as sarcasm. “Although the night has been filled with such amusements, isn’t that boring?” Hifumi laughed. Hifumi pondered whether he should kill Phegor who walks while having his back turned towards him, but he thought it’s fun just like it is now. In case Vepar really shirked away from the king’s seat, it might be necessary to place Phegor on the king’s throne instead. The mental state of Phegor, who walks while stepping firmly on the stone floor with a hard sound resounding, can’t be read from his expression. His innermost thinking was complicated. He has absolute trust in the strength of the king. Moreover he has prepared a trap. For Phegor, who knows the human’s strength to some degree, the appearance of the king is unnecessary. That’s what his honest impression is. However, the strength of Hifumi, shown in front of the castle’s gate, deviated from the strength Phegor knew of humans. If that’s the king’s wish, he will throw down his life at any time. However, I cannot afford to not live up to the king’s expectations. He properly knows from the footsteps that Hifumi is following him. Coming out from the not-so-long hallway, Phegor arrived at the targeted place. Magic lights are shining all over in the cylindrical room which became a hall with up to 3 floors. The swaying lights produced a fairytale-like atmosphere. He heard Hifumi’s impression, but Phegor didn’t return any words. Rather than that, Phegor is worried whether the device will work as intended or not. And, inside the hall, there was also the figure of Agathion who was seated on the throne placed on a platform. “It’s still too early for good morning, I guess” Agathion showed a smile, but he doesn’t stand up like he did during the day. He looks down on Hifumi while leaning on his elbow as if showing that he is the one ruling. While talking with each other, Hifumi naturally steps forward. Hifumi wondered whether something would start there, but being disappointed by Phegor as he turns nothing but his look at him, he concentrates on Agathion who is in front of him. At the time Hifumi came close to the centre of the hall, Agathion began to talk about something. Hifumi, who stopped, shook the katana he held in his hand. Standing up, Agathion spread both his hands. Hifumi looks at him wondering whether he intends to release magic, however he can’s see any sign of that. Hifumi, who expected offensive spells to be hurled at him, looked in the direction of Phegor at those words. Phegor was simply standing there with both his arms loosely dangling. However, Hifumi noticed that the sky in his own surrounding had changed. He saw a faint membrane gradually surrounding the vicinity. Agathion replied with a generous waving of his hand towards Phegor who bowed his head. And he chuckles as he watches Hifumi who was locked up by the barrier. At Agathion’s sign Phegor erased another deployed barrier. It was the assembly of stones which are usually holding the ceiling with a barrier supporting the hall’s ceiling. Removing the fixing installations in advance, the stones, which were supported by Phegor’s barrier, begin to crumble while being pulled by gravity. Naturally large stones are falling one after the other onto Hifumi who looked up at its state from directly below. While the broken stones are scattering with a thunderous roar and a cloud of dust, the debris is piling up within the cylindrical barrier. Agathion’s laughter mixed with the violently reverberating sound until the last piece fell. Well, the king will cough while choke after this I do say. Shasu, hope you get better from sick and thanks for the chapter. Well a worthy idiotic king. Hifumi strength does not come alone in his katana but also the capabilities of handling different types of combat weapons in purpose of killing well the Demons doesn’t know that. He is also given divine blessing from that Zeus-like face god, that Japanese War God and Death. His main attribute is darkness and have also overwhelming strength that the demons doesn’t know as well. What I remember in the early chapter that his task from summoning told by those three entities is doing that classical heroic type against the Demon King that was main goal but Hifumi goes a different path but instead turn the world he summon to forcibly advanced through wars and death in which our world is like that from the bloody beginning spanning 500,000 years in the making of our history. Random question ; Does anyone know/count how many years has it been since Hifumi first come/transferred to this world by Imeraria? I expected this cliff. Yet I had to read this chapter because the song put me in a good mood. Now I’m sad that I see this cliff. Anyone know/counting how many years has it been since Hifumi first come/transferred to this world by Imeraria? Many Thanks Shasu-sama! Hope you get better soon. Nice to see more Hifumi-ism believers. Though, jokes aside, I think that way of living is nice, after all dying without regrets would be ideal. Furthermore, no one actually believes Hifumi is dead, right. 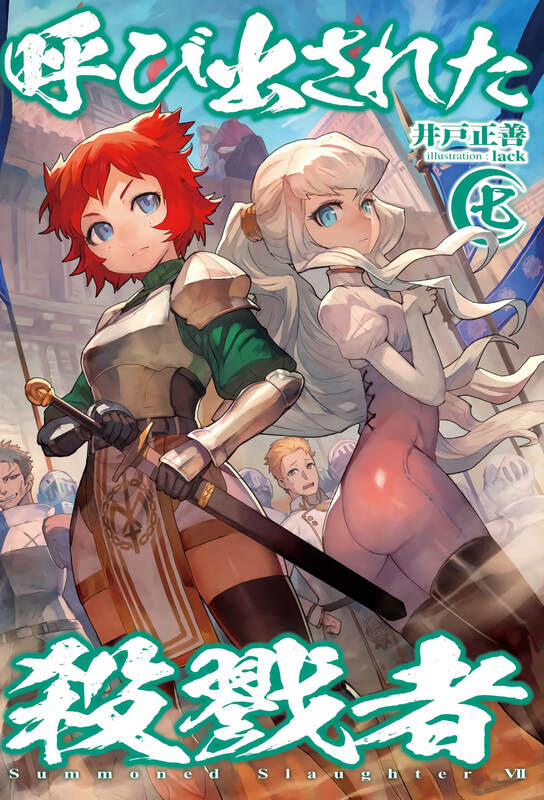 Pingback: Yobidasareta Satsuriku-sha (Summoned Slaughterer) Chapters 112 – Many Thanks Shasu-sama! – Regarding Being Saved by Anime, Manga, Light Novels and Visual Novels (AMLNVN). Thanks for the chapter, eagerly waiting to see how that smile is erased from the King face when Hifumi kills him and all his schemes!!!!!! That king is in for a big surprise.I can’t wait for the next chapter. Woah woah that’s a huge understatement this demons has on Hifumi just because of his katana.